Rushden is lovely town full of wonderful attractions and landmarks also friendly people. We have been hog roasting in Rushden for a long time now and are very pleased we started to. Whether it’s rain or shine or even snowing the people of Rushden love a hog roast and so do we. Rushden has a few museums and one that should be visited is the Rushden Transport Museum takes you back to the olden times and is a great experience for anyone. We hope to hog roast for them in the future as well as other museums. We have been providing the lovely people of Rushden with our delicious hog roasts and not forgetting our esteemed canapés and desserts and starters. 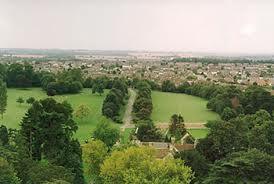 Rushden have a number of Leisure Facilities, Football Clubs, Rugby Clubs, Golf courses and even its own Air Training Corps Squadron it is run by officers who are commissioned in the Royal Air Force Volunteer Reserve. It would be a massive honour and feat for us to provide them with hog roast. We want to become more and more popular within the community and then hopefully provide some big companies with hog roasts. The hog roast Rushden speciality is roasting pigs of all shapes and sizes, for your business breakfast there’s a couple of options though, it isn’t just pigs that are on the menu. On the menu also is spit roasted chicken, lamb, turkey and beef. Or if you want something more conventional for your business breakfast our menus also have the options for sausage and burgers, both are made from real all-natural ingredients by our Spitting Pig chefs. These many options are all served in fresh bread rolls with appropriate seasoning, stuffing and sauces where necessary. A business breakfast can be all kinds of great tasting food when you book hog roast Rushden to whip it up for you. Catering at large corporate functions is something we know all about, having catered at hundreds of seminars, business evenings; team building exercises and the like. We have an experience and understanding of these events that is far reaching, and aids us every time we cater a hog roast Rushden for a corporate event. As you already know we are connoisseurs of hog roasting but our skills in roasting other meats by far exceed the quality of our competitors. A recent event saw us cater for 80 guests who required whole roasted chicken served with stuffing and homemade onion gravy accompanied by a choice of two freshly prepared salads and some warm new potatoes in herb butter. Our waiting staff efficiently served the guests with their meal and made sure they had plenty to drink. The plates were quickly removed from the tables when the guests were finished enjoying their mains only to be replaced with the dessert of their choice which was luscious chocolate torte. 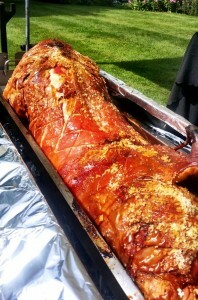 Safe to say the guests were in awe of the quality of service hog roast Rushden brought to the table. Above all else one of the biggest positives to Spitting Pig catering is in the fact that you can’t pigeon hole what we do; we cater each event with menus that vary greatly. It’s not just the food served that changes from menu to menu, it’s just as much about the service – and the service changes just as much as the food we serve for a hog roast Rushden We have hog roasts, sit-down menus, buffet menus, and they can be either formal or informal depending on the character of your corporate event. It’s no good to have great food if it’s served in a manner unsuitable for your event, that’s why with a Spitting Pig hog roast Rushden you can decide how you want the hog roast to be served.